This blogpost is brought to you by FoodCorps California Service Member, Ceanna Vangelder, with Oakland Unified School District and the California Farm to School Network. Read on to learn about how Ceanna brings fresh produce to nearby schools in Oakland, CA. Every Tuesday, an order of specially chosen fresh produce arrives at East Oakland PRIDE (EOP) Elementary School, and every Wednesday, with the help of my market volunteers, we make a colorful spread of fruits, vegetables, and nuts to sell in the parking lot in front of the school. It’s not quite that simple, of course, but after 11 market weeks, the positive impact of the often-challenging job is more apparent and the sales are up. 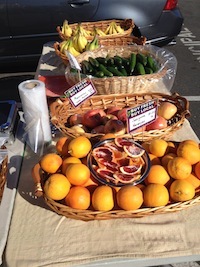 There are currently 18 schools in the Oakland Unified School District (OUSD) with a weekly market. Sixteen of the 18 markets—including EOP’s—are supported and organized by Oakland Fresh, a program created through a partnership between OUSD Nutrition Services and East Bay Asian Youth Center (EBAYC). Since the first markets in the ’09-’10 school year, the program has been expanding and improving, fulfilling its mission “to build a school-based local food system that increases access to fresh, healthy and affordable food for Oakland residents and promotes healthy school environments for our children and families” (Nutrition Services, OUSD). Each market site has its own strengths and shortcomings. Some markets sell out of two overflowing tables of produce in a few hours, while others focus on a few trusty items each week while they gain a customer base. When parents manage and run the market at their child’s school, which is the case for the majority of the markets, they are automatically part of a network of parent customers. From shadowing two parent-run markets, I sensed the trust between the parents behind the market scale and those loading up bags of fruits and vegetables to purchase. Other parents who initially seemed uninterested in the produce would still stop to chat, lingering over the $1 bags of red grapes until they too grabbed one for their child’s after school snack. So, on my first market day in September, new to the school and obviously not a parent, I was acutely aware of the essential trust that I lacked. Was I in a position to run a successful market? On Mondays and Fridays I teach garden and nutrition classes in EOP’s garden. I see my classes weekly, for 35-55 minutes, and each week we care for our plants, observe and discuss changes in our growing plants, and grow to know each other better as well. At this point in the year, I can count on a 30-Kindergartener bear hug/tackle when I walk across the blacktop during recess. I can also count on my students to pull their parents over to the produce market after school on Wednesdays. As soon as I began meeting parents, via the very formal introduction of their 1st grader, I began noticing more interest in the market. Time, of course, is the most important part of building relationships, but my students gave me just the boost I needed to stay hopeful.